Montana populations were declining until recently and the species is declining in most or the surrounding states and provinces. CommentGrassland covertypes have been drastically reduced in Montana since European arrival. CommentBreeding Bird Survey (BBS) data for Montana is of moderate credibility and shows a 4.3% increase per year or 52% increase per decade between 1999 and 2009 with the confidence interval overlapping zero. However, the 2009 review indicated a very rapid decline during drought years (B = 50-70% decline) and most surrounding states and provinces have declining trends. Across the species' range and in prairie pothole region there is a significant decline of 0.5 or 0.4% per year or ~5% decline per decade, respectively. Thus, the short-term population trend is probably best regarded as declining to possibly stable. CommentHabitat loss, grazing, and mowing all represent threats to Montana populations. CommentGrassland cover structure can recover relatively quickly from grazing and fire and the species does use CRP so would be expected to recover from a population decline within 10-50 years. CommentThreats seem likely to affect 20-60% of grassland habitats species is dependent on. CommentNarrow Specialist. Species is dependent on moderately tall and dense grassland. The sexes of Baird's Sparrow are similar in appearance. The top of the head and nape are a rich, strong brownish-yellow, striped with black, especially on the sides of the crown and nape. The sides of the head and neck are pale buff and flecked with black with a narrow line of black spots on the side of the throat. The back feathers are dull black centrally, margined with grayish-white, producing a streaked appearance. The rump is lighter, more buffy. Underparts are white or pale buff on the throat and breast, streaked on the sides, flanks and across the breast with black. The streaks on the breast are sharply defined and form a necklace; those on sides are more diffuse and tinged with rufous. Wing feathers are grayish-brown, coverts are darker centrally, and all are edged with pale rufous. Two wing bars are present but indistinct. The length of the bird is 5.3 to 5.6 inches (13.5 to 14.2 cm), with a wing length of 2.75 to 3.0 in (7.0 to 7.6 cm) and tail length of 2.1 to 2.3 in (5.3 to 5.8 cm). The tail is dull brown or blackish. The middle pair of tail feathers is narrower and more pointed than the others, the outer feathers are narrowly edged with white and dull white terminally, while the other tail feathers are narrowly tipped with dull white or buffy. The bill is light flesh color and darker at the tip. The legs are flesh color, the feet are darker and the irises are brown. In Alberta, the average weight was 17.8 grams for females and 18.9 grams for males (Maher 1979). The juvenile resembles the adult but with more diffuse markings; the buff of the head and nape is pale (Roberts 1949). The song is best described as a high, clear jingling of notes. The several clear high "tink" notes are followed by clear musical trill "tik a tl tleeeeee" (Sibley 2000). The call is a high, thin "teep." Field marks include a broad, ochre median crown stripe, a narrow band of fine black streaks across the breast, and outer tail feathers that often look white, especially in flight (Godfrey 1966, Peterson 1980). Two other common species in Montana with which the Baird's Sparrow may be confused are the Savannah Sparrow (Passerculus sandwhichensis) and the Grasshopper Sparrow (Ammodramus savannarum). The Savannah Sparrow is more heavily streaked (on both the back and breast), has a complete strong eye-line and mustache stripe, and, usually, a yellowish supraloral (Sibley 2000, Green, et al. 2002). The adult Grasshopper Sparrow has a similarly shaped head and bill, but lacks the striping in the breast and the dark lateral throat stripe, apparent in the Baird's Sparrow. The juvenile Grasshopper Sparrow has streaking on the breast, but as with the adult, lacks the dark lateral throat stripe and distinct auricular patterns of the Baird's Sparrow (Sibley 2000, Green et al. 2002). 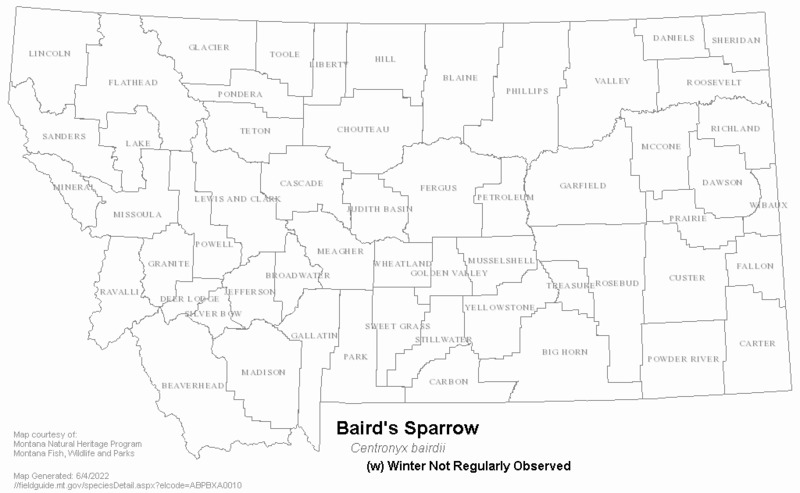 The extreme dates of Baird's Sparrow in Montana are April and September, represented by only two individual observations, both west of the Continental Divide (Montana Bird Distribution Committee 2012). More common east of the Continental Divide, the majority of observations of the species in the state occur at the earliest in May and the latest in July (Montana Bird Distribution Committee 2012). Baird's Sparrows prefer to nest in native prairie, but structure may ultimately be more important than plant species composition. Nesting may take place in tame grasses (nesting has been observed in crested wheat, while smooth brome is avoided) (Sutter 1998). This sparrow has also been found to use drier areas during unusually wet years, and wet areas during unusually dry years (Casey 2000). Because a relatively complex structure is so important for nesting, areas with little to no grazing activity are required. Food habit information for this species is not available for Montana. Studies in other areas of the species' range indicate that Baird's Sparrows eat seeds, insects, and spiders and forage on the ground (Terres 1980). Nestlings are fed an exclusive diet of insects. In Manitoba, nestlings were fed grasshoppers, crickets and moths (Cartwright et al. 1937, Lane 1968). In Saskatchewan, nestlings ate grasshoppers and spiders (Maher 1979). The adult diet changes substantially between seasons. In the winter, spring and fall, adults mostly eat seeds, whereas during the breeding season, spiders, leafhoppers, grasshoppers, moths and small seeds comprise the diet (Cartwright et al. 1937, Lane 1968). Ecological information regarding this species in not available for Montana. In general, breeding territories average about 0.4 to 0.8 hectares (Lane 1968, Terres 1980, Martin and Boczkiewicz 1993). Breeding density can range from 0.13 pairs per hectare (Stewart and Kantrud 1972) to 0.41 pairs per hectare (Johnson 1974); density in Saskatchewan was up to 0.27 pairs per hectare (Pylypec 1991). In North Dakota, mammalian predators probably include White-footed Mice (Peromyscus leucopus), Thirteen-lined Ground Squirrels (Citellus tridecemlineatus), Short-tailed Weasels (Mustela erminea), Long-tailed Weasels (M. frenata), Least Weasels (M. rixosa), Striped Skunks (Mephitis mephitis), and Coyotes (Canis latrans) (Lane 1968). The remains of a Baird's Sparrow was found by the nest of a Northern Harrier (Circus cyaneus) and in the stomach contents of a Merlin (Falco columbarius) (Lane 1968). Baird's Sparrows do not form winter flocks. Baird's Sparrows are very rarely parasitized by Brown-headed Cowbirds (Molothrus ater) and most, if not all, of the reported parasitized nests contained eggs. In Manitoba, two of 13 nests were parasitized (De Smet and Miller 1989). The effect of brood parasitism on nesting success is not known. In addition to independent monitoring projects designed to obtain baseline population data and relative species abundance information (at Medicine Lake National Wildlife Refuge, for example), Baird's Sparrows have been recorded on Montana's Breeding Bird Survey routes. 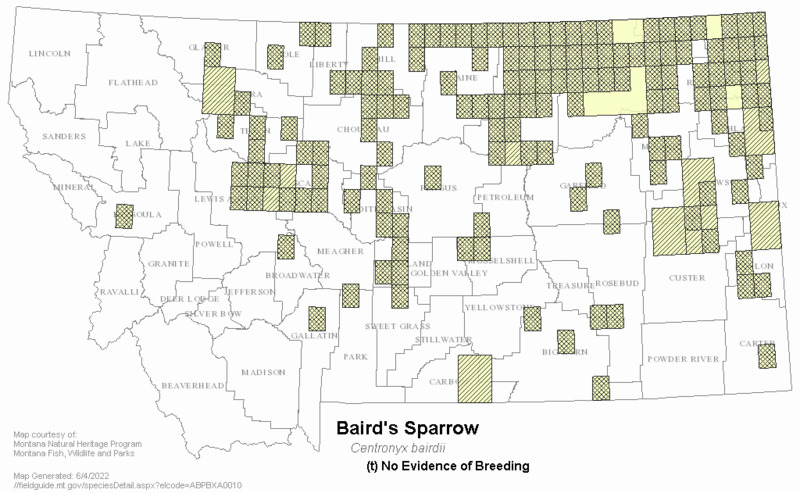 Otherwise, little information specific to Montana exists regarding Baird's Sparrow reproduction. 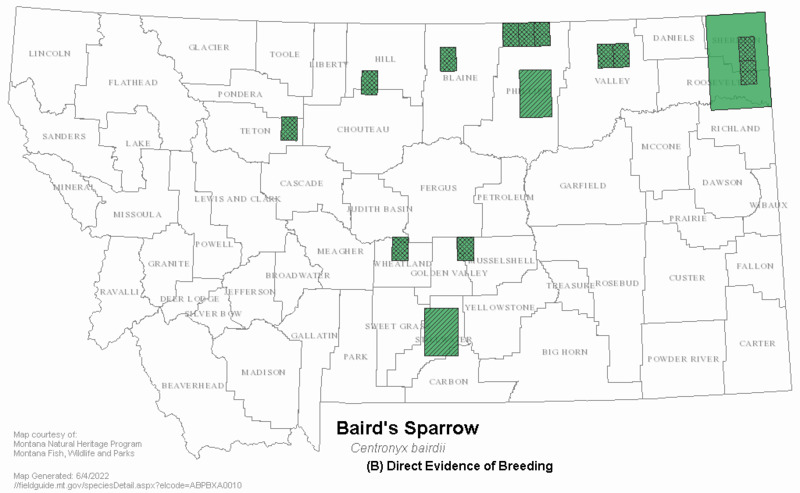 Direct evidence of breeding has been recorded at Bowdoin National Wildlife Refuge, Medicine Lake National Wildlife Refuge, in Sheridan County, at Freezout Lake, and in the Great Falls area (details of these observations are limited) (Montana Bird Distribution Committee 2012). Nests with three to five eggs have been observed at Bowdoin National Wildlife Refuge (Montana Bird Distribution Committee 2012). Nearly one hundred fifty records indicate indirect evidence of breeding, but only ten records of actual nests have been reported (Montana Bird Distribution Committee 2012). Nesting generally begins in late May and continues through August (Casey 2000). Other species nesting in association with Baird's Sparrow include the Sprague's Pipit (Anthus spragueii), Grasshopper Sparrow (Ammodramus savannarum), Vesper Sparrow (Pooecetes gramineus), and Western Meadowlark (Sturnella neglecta) (Casey 2000). Most reproductive data comes from studies of Baird's Sparrows in other areas of the their range. These studies reveal the breeding season occurs from late May through mid-August in North Dakota, with the peak in early June through late July (Stewart 1975). Males arrive on the breeding grounds first and immediately set up territories; females arrive three to seven days later. Eggs are laid mostly from June to July. Normally, four or five eggs are laid, although three- and six-egg clutches are possible (Lane 1968). Incubation, by the female, lasts 11 to 12 days. The female does all the brooding and for the first two to four days does all the feeding of the nestlings. The young are well feathered when they leave the nest but are not able to fly and are fed almost exclusively by the male. Young leave the nest at 8 to 10 days, hide in grass, first fly at 13 days, and begin to leave the parents' territory at 19 days. The Baird's Sparrow tends to nest in semi-colonial groups of a few pairs. Two broods are often raised; the length of the interval between nests depends on whether or not the pair stays together for both nests. Cartwright et al. (1937) found three double-brooded females: two retained the same mate for both nests and one female switched mates. The females that retained their first mates began laying the second clutch one day after the first brood left the nest; the female that switched mates began laying the second clutch eight days after the first brood departed. The three types of nests are all located on the ground (Cartwright et al. 1937). The first type consists of tufts of grass held up by a shrub. The tuft is hollowed out with a bottom layer of grass, and the sides of up to five inches (12.7 cm) tall are woven with grass. A second type of nest is located underneath an overhanging tuft of grass, with a small opening located on the side. The most common type of nest is built in a depression in the ground with no overhead concealment. All nests are made of woven dead grass and lined with finer grass, hair and moss. The average dimensions for 11 Manitoba nests were 2.5 inches (6.3 cm) in diameter and 1.5 inches (3.8 cm) deep (Cartwright et al. 1937). The eggs of the Baird's Sparrow are white and ringed with reddish-brown spots or blotches and are difficult to distinguish from Savannah Sparrow (Passerculus sandwichensis) and Vesper Sparrow (Pooecetes gramineus) eggs. The average size is 19.4 x 14.6 mm (Lane 1968). Baird Sparrow nests are difficult to locate (Cartwright et al. 1937, Lane 1968). Females hold tight to the nest; they do not flush from the nest until they are almost stepped upon. In one instance, a female did not flush even when a rope was dragged over her (Cartwright et al. 1937). Cartwright et al. (1937) reported that 15% (6 of 40) of the nestlings on his study area did not survive to leave the nest. The major predators were probably small mammals and birds (Cartwright et al. 1937). Management recommendations specific to the Baird's Sparrow in Montana include: preservation of remaining native grassland habitat; prescription burning of areas to prevent encroachment by woody vegetation; delayed mowing until mid-July or August (later, rather than sooner, if spring weather has been adverse); light grazing; and maintaining vegetative diversity (Casey 2000). Management priorities should include securing scattered patches of forbs, grasses of various heights, and a variety of litter densities in large enough blocks of grassland adequate to support numerous nesting territories (Casey 2000). They are a Species of Management Concern in U.S. Fish and Wildlife Service Region 6 (USFWS 1995). Cartwright, B. W., T. M. Shortt, and R. D. Harris. 1937. Baird's sparrow. Transactions of the Royal Canadian Institute, Toronto 21(2):153-197. De Smet, K.D. and W.S. Miller. 1989. Status report of the Baird's sparrow (Ammodramus bairdii). Report to the Committee on the Status of Endangered Wildlife in Canada. 28 pp. Godfrey, W. Earl. 1966. The birds of Canada. National Museums of Canada, Ottawa. 428 pp. Johnson, D. H. 1974. Mixed prairie III. American Birds 28:1030. Lane, J. 1968. Ammodramus bairdii (Audubon). Baird’s Sparrow. Pages 745-765 in Life histories of North American cardinals, grosbeaks, buntings, towhees, finches, sparrows, and allies (O. L. Austin, Jr., Ed.). United States National Museum Bulletin No. 237, Part 2. Maher, W.J. 1979. Nestling diets of prairie passerine birds at Matador, Saskatchewan, Canada. Ibis 121:437-452. Martin, B. H. and S. Boczkiewicz. 1993. Baird's sparrow and Sprague's pipit population and habitat monitoring at Conservancy preserves in North Dakota. Rodney Johnson Grant Report. 13 pp. Peterson, R.T. 1980. A field guide to the birds east of the Rockies. Houghton Mifflin Company. 383 pp. Pylypec, B. 1991. Impacts of fire on bird populations in a fescue prairie. Canadian Field Naturalist 105: 346-349. Stewart, R. E. and H. A. Kantrud. 1972. Population estimates of breeding birds in North Dakota. The Auk 89(4):766-788. Sutter, G.C. and R.M. Brigham. 1998. Avifaunal and habitat changes resulting from conversion of native prairie to crested wheatgrass: patterns at songbird community and species levels. Canadian Journal of Zoology 76:869-875. American Ornithologists' Union. 1957. Checklist of North American Birds. 5th edition. Baltimore: Lord Baltimore Press. 691 pp. Bergeron, D., C. Jones, D.L. Genter, and D. Sullivan. 1992. P. D. Skaar's Montana Bird Distribution, Fourth Edition. Special Publication No. 2. Montana Natural Heritage Program, Helena. 116 pp. Berkey, G. B. Personal communication. Davis, S. K. and S. G. Sealy. 1998. Nesting biology of the Baird's sparrow in southwestern Manitoba. Wilson Bull. 110: 262-270. Davis, S.K., D.C. Duncan, and M.A. Skeel. 1996. The Baird's Sparrow: status resolved. Blue Jay 54(4):185-191. Dryer, P. North Dakota Natural Areas Coordinator. Personal communication. Faanes, C. A. 1982. Avian use of Sheyenne Lake and associated habitats in central North Dakota. U. S. Fish and Wildlife Service, Resource Publication No. 144. Goosen, P. Biologist, Canadian Wildlife Service, Edmonton, Alberta, T6B2X Canada. Goossen, J.P., S. Brechtel, K.D. De Smet, D. Hjertaas, and C. Werschler. 1993. Canadian Baird's Sparrow recovery plan. Recovery of Nationally Endangered Wildl. Rep. No. 3. Ottawa: Can. Wildl. Fed. 28 pp. Hammond, J., J. Wood, P. Gouse, and S. Jones. 1997. Grassland songbird reproduction monitoring on the Bowdoin National Wildlife Refuge, special emphasis on Baird's sparrow and Sprague's pipit: results from the 1997 field season. Point Reyes Bird Observatory and U. S. D. I. Fish & Wildlife Service Mountain-Prairie Region. 7 pp. Kantrud, H. A. 1981. Grazing intensity effects on the breeding avifauna of North Dakota native grasslands. Can. Field-Nat. 95:404-417. Kantrud, H. S. and R. L. Kologiski. 1983. Avian associations of the northern Great Plains grasslands. Journal of Biogeography 10:331-350. Kantrud, H.A., and C.A. Faanes. 1979. 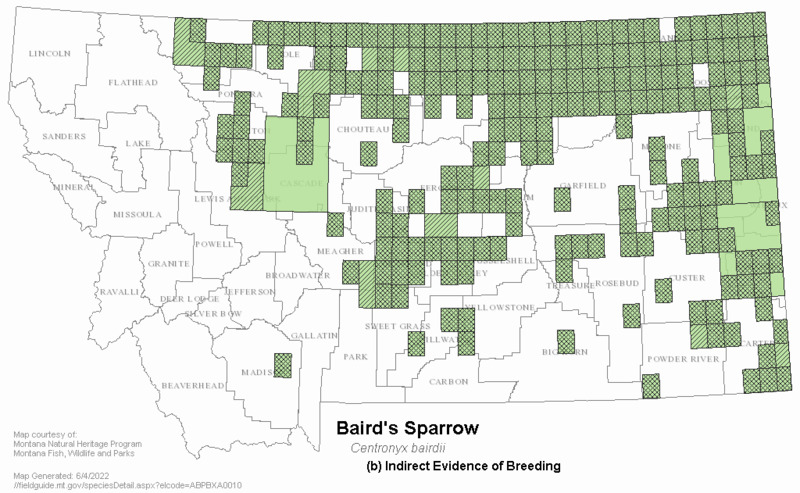 Range expansion of Baird's sparrow in South Dakota. Prairie Naturalist 11:111-112. McMaster, D. G., and S. K. Davis. 1998. Non-game evaluation of the Permanent Cover Program. Unpublished report, Saskatchewan Wetland Conservation Corporation, Regina. Montana Dept. of Fish, Wildlife and Parks. Region Four., 1996, Draft Environmental Analysis for Weed Management. Owens, R.A. and M.T. Myres. 1973. Effects of agriculture upon populations of native passerine birds of an Alberta fescue grassland. Can. J. Zool. 51: 697-713. Salt, W. R. and A. L. Wilk. 1958. The birds of Alberta. Smith, K. Biologist. The Lost Woods National Wildlife Refuge, North Dakota. (701) 848-2722. Personal communication. Sousa, P. J. and W. N. McDonald. 1983. 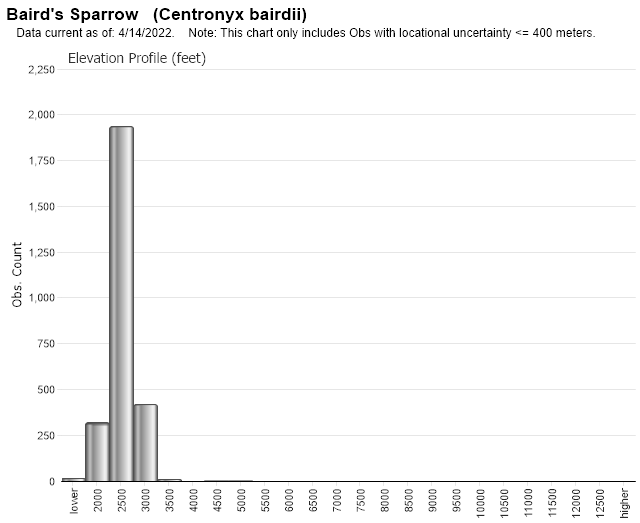 Habitat suitability index models: Baird's Sparrow. U.S.D.I., Fish and Wildl. Serv., FWS/OBS-82/10.44. Zink, R.M., and J.C. Avise. 1990. Patterns of mitochondrial DNA and allozyme evolution in the avian genus Ammodramus. Systematic Zoology 39:148-161. Web Search Engines for Articles on "Baird's Sparrow"